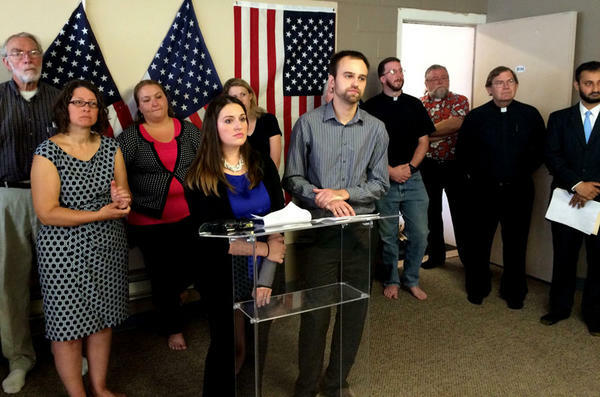 Clergy from Spokane-area churches joined members of the Muslim community at a press conference to condemn anti-Muslim graffiti found at a Bosnian heritage center. 'Death to Islam' was scrawled on the side of the Bosnia and Herzgovina Heritage Association of Spokane. Muslim leaders and Christian clergy in Spokane are asking for a federal hate crime investigation into anti-Muslim graffiti discovered on the Fourth of July. 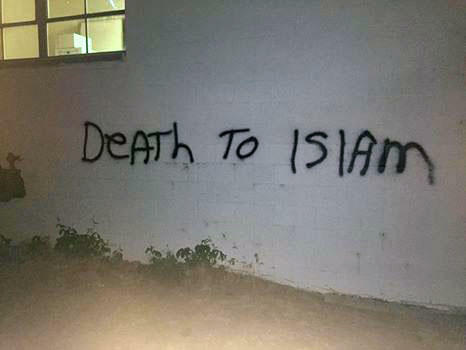 Someone scrawled the phrase “Death to Islam” on the side of a Bosnian heritage center. The Bosnia and Herzgovina Heritage Association of Spokane is usually a place where members gather to celebrate holidays and watch soccer. But for the holy month of Ramadan, two pool tables have been pushed against the wall to make room for prayer. Admir Rasic told reporters it was while leaving the evening prayer session late last Saturday that he first discovered the message. The Washington chapter of the Council on American-Islamic Relations is asking the federal prosecutor in eastern Washington to investigate. Spokane police say they took photos of the graffiti and a Spokane detective who’s on the FBI Anti-Terrorism Task Force is looking into the case. A spokeswoman at the FBI’s Seattle office says agents are in communication with local police. She said typically they defer to the local investigation at this point in the process. Clergy from Spokane-area churches joined members of the Muslim community at Thursday’s press conference to condemn the vandals’ message.